Dr. Rotimi Aluko is a Professor of Human Nutritional Sciences at the University of Manitoba, Winnipeg, Canada. He has BSc and MSc degrees in Biochemistry from Nigeria and a PhD degree in Food Chemistry from the University of Guelph, Ontario, Canada. From 1998 to 2001 he worked as a Research Scientist with Agriculture & Agri-Food Canada (AAFC), Saskatoon Research station. In 2001 he joined the Department of Human Nutritional Sciences at the University of Manitoba, Winnipeg as an Assistant Professor and was promoted to Associate Professor in 2006 and to Full Professor in 2010. He is currently Chair of the Graduate Program in the Department of Human Nutritional Sciences. In addition to his undergraduate and graduate teaching duties at the University of Manitoba, his research program focuses on structure-function properties of food proteins as well as development of natural food protein-derived bioactive peptides, especially for the treatment of hypertension and kidney disease. One of the products he developed is a pea protein hydrolysate (PPH) that has been shown to reduce blood pressure and ameliorate kidney disease progression in experimental chronic kidney disease rats. In a recently concluded clinical trial, the PPH was also effective in reducing blood pressure in hypertensive human subjects. The PPH is currently undergoing final testing towards eventual commercialization. He has trained several students and postdoctoral fellows some of whom are now Assistant Professors, graduate students, industry employees and Research Technicians. He currently supervises three postdoctoral fellows, two PhD students, and four MSc students all working in the area of bioactive peptides that can be used to formulate functional foods and nutraceuticals. He is the author of over 60 peer-reviewed journal publications and two patents. He has received over $1.2 million dollars in research and equipment funding since 2001. Dr. Aluko received the University of Manitoba Merit Award for excellence in research and service for 2006, 2008 and 2009. He is a member of Canada’s Advanced Food s and Materials Network of Centre of Excellence (AFMNet) where he is a Principal Investigator as well as Network Investigator for various projects. He currently serves as a member of Natural Sciences and Engineering Research Council (NSERC) of Canada’s Discovery Grant Biological Systems and Functions Evaluation Group. NSERC is the main funding agency for Natural Sciences and Engineering research programs in Canada. Dr. Aluko was Chair of the Manitoba Section of the Canadian Institute of Food Science and Technology (CIFST) from 2006 to 2008 and is currently President-Elect of the Institute. He was a member of the planning committee and co-Chair of the Technical Session for the 2010 CIFST conference in Winnipeg, Canada. He currently serves as the guest editor for a special edition of Food Research International journal to be published in 2011 and dedicated to papers presented at the 2010 CIFST conference. He previously (2008-2010) served as Chair of the Protein & Co-products section of the American Oil Chemists’ Society. He is also a professional member of the Institute of Food Technologists and other professional organizations such as the American Chemical Society, International Society for Nutraceuticals and Functional Foods, the Society of Chemical Industry, the Nigerian Institute of Food Science and Technology, and the Canadian Nutrition Society. Dr. Aluko is a regular reviewer of manuscripts for several scientific journals. 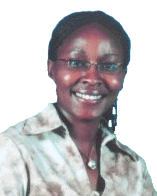 Patricia Wanjiru Gitari, born 11th January 1974 studied BSc (Chemistry and Biochemistry) at Egerton University (1993-1998), earned an MSc in chemistry at University of the Witwatersrand, Johannesburg (2002-2003) and Ph.D in Pharmacology at University of Pretoria (2004-2007). During this time, I was involved in the Cancer Association of South Africa (CANSA) drug development consortium which was headed by the renowned researcher, Prof Connie Medlen. The Ph.D research project subsequently led to a patent for ‘a composition for the treatment of cancer’ which was based on palladium and platinum phosphine complexes. In 2008, I held a 1 year Postdoctoral fellowship at the laboratory of one of the leading researchers in malaria, Prof Kelly Chibale, Department of Chemistry, University of Cape Town. During this time, I worked on lead optimisation of potential anti-malarial compounds in a WHO/TDR sponsored project. After returning to Kenya in 2009, I was appointed as a lecturer in inorganic chemistry at the University of Nairobi. Besides teaching, my research interests are in design, synthesis and method development in drug discovery with special reference to cancer and malaria. Due to the versatility of transition metals, my intent is to cultivate an interest in design and synthesis of coordination compounds that have applications in chemotherapy and catalysis. I am currently involved in organising the International Year of Chemistry (IYC 2011) events in my institution. The IYC 2011 goals are to increase public appreciation of chemistry in meeting world needs, to encourage interest in chemistry among young people, and to generate enthusiasm for the creative future of chemistry. I look forward to the day Kenya and Africa in general will invest in science and technology to improve the living standards of its citizens. I have a 7 year old daughter, Erica.